Talkdesk is a browser-based call center software used in sales, customer support and marketing. Talkdesk will automatically synchronize contacts, activities, and notes between OnePageCRM and Talkdesk in real-time and display customer’s contact history and information from OnePageCRM to Talkdesk. Go to Apps → All Integrations → click on the Talkdesk icon under the Communication apps category. 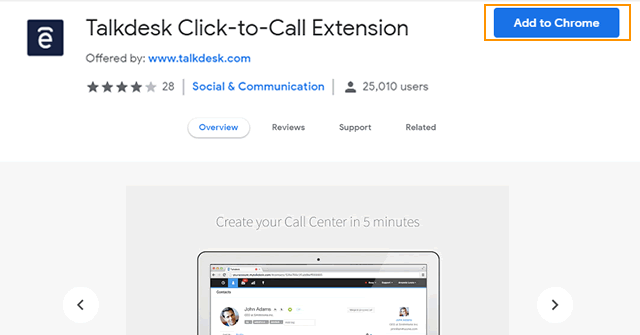 Click Add to Chrome to install the Talkdesk extension to your Chrome browser. In the pop-up, click Add extension. Login to your Talkdesk account. 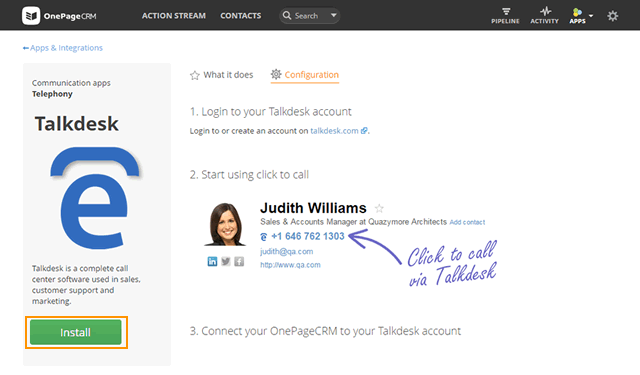 In OnePageCRM open a contact and click on the phone number to Call using Talkdesk. Once you've completed your call, you've the option to add call note details in OnePageCRM.